The body size and shape may be familiar, but these are some of the very first Lowdens with a 12th fret neck join and re-designed bracing. 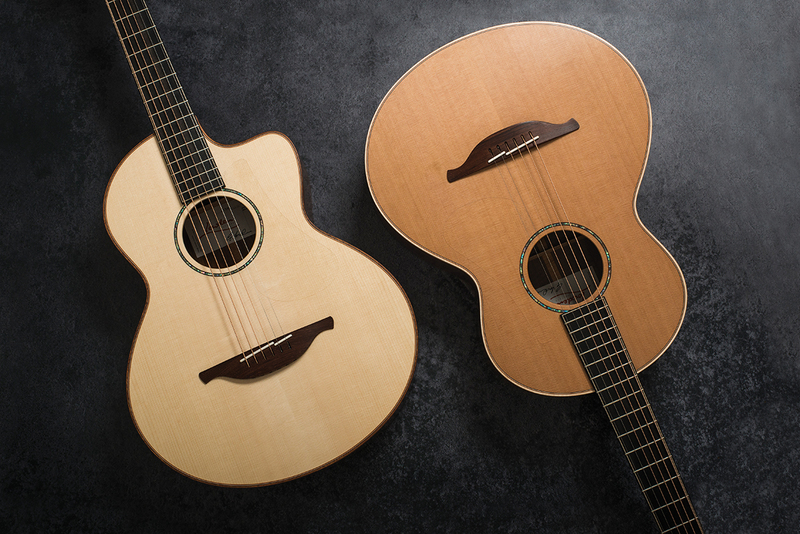 These instruments represent a departure of sorts for Northern Irish guitar institution, Lowden Guitars. They’re the very first 12-fret models the company has produced and they feature a reworked bracing pattern. 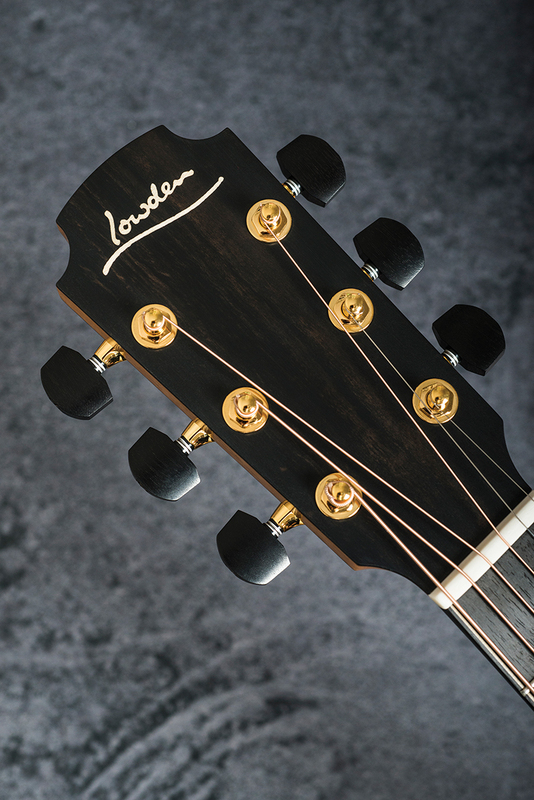 After falling out of favour for decades, acoustics with 12-fret body joins have made a strong comeback, but by Lowden’s own admission, it’s slightly late to the party. It seems customer requests reached critical mass and George Lowden decided the time had come. The body shape itself isn’t new, being identical to Lowden’s S-size models. The scale length is the same, too, which is why the bridge had to be back-shifted towards the centre of the lower bout and the bracing needed to be tweaked. In essence Lowden’s long-established A-frame bracing is retained, but there are alterations in the area between the bridge plate and the tailblock. 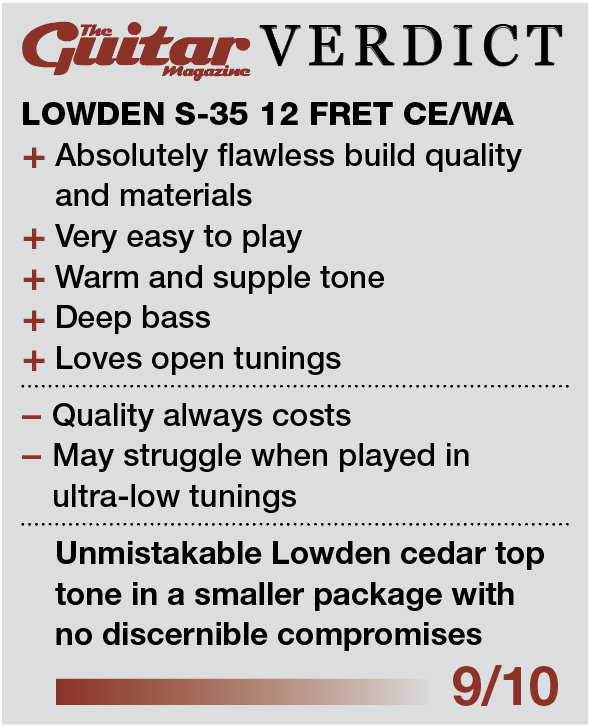 Lowden experimented with both the angles and numbers of tone braces. A couple of designs made it through to the prototype stage and it was decided that one of the designs gave the guitar more of a traditional American voicing, while the other was far more in keeping with the Lowden sound. Understandably George and co decided to go with the latter. These models recently took a bow at the NAMM show and there are three timber combinations to choose from. In addition to the models we’re reviewing – cedar with walnut back and sides and Adirondack spruce with cocobolo back and sides – standard models include Alpine spruce with Madagascar rosewood back and sides, and a choice between Sitka or Adirondack spruce with Indian rosewood. More tone timber combinations are available upon request, but are subject to a custom charge. Other custom options include a cutaway, soundbox bevel, custom neck sizes, shallow neck profile and adding a factory fitted Fishman Matrix Infinity pickup system. Let’s take a closer look at each of the guitars we have here. 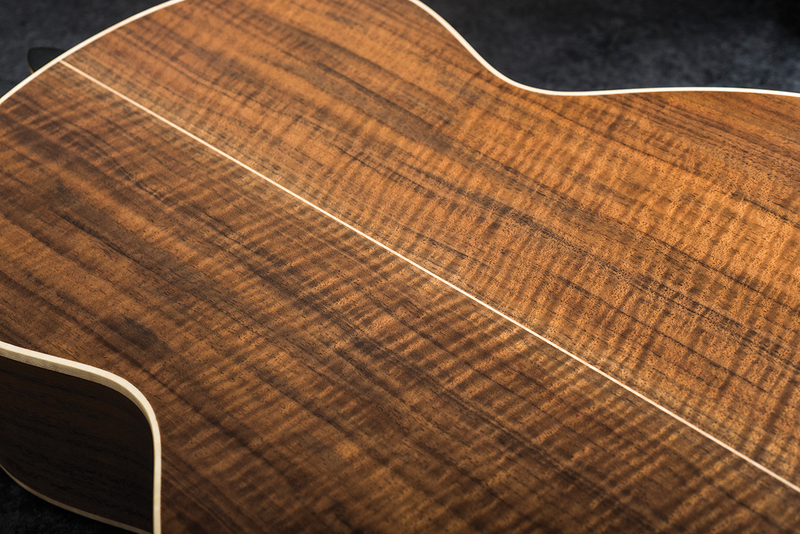 Starting with the non-cutaway model, we have walnut back and sides characterised by vivid flamey figuring and the mellow honeyed look of cedar with almost ruler straight grain. 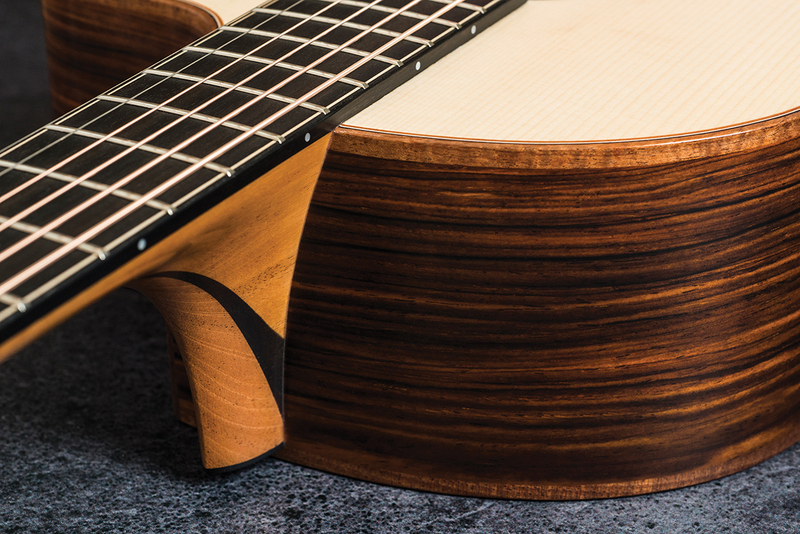 Lighter figured maple binding creates a visual contrast that serves to define the shape. 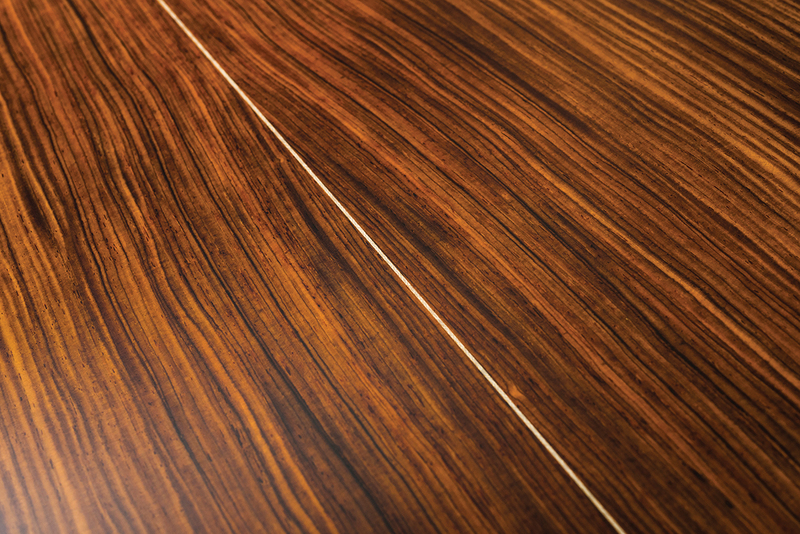 Cocobolo grain may appear similar to rosewood, but the colour is far ‘rosier’. This time the figured maple bindings are stained so they almost blend into the back and sides and the colour contrast comes from the pale and slightly creamy Adirondack spruce top. 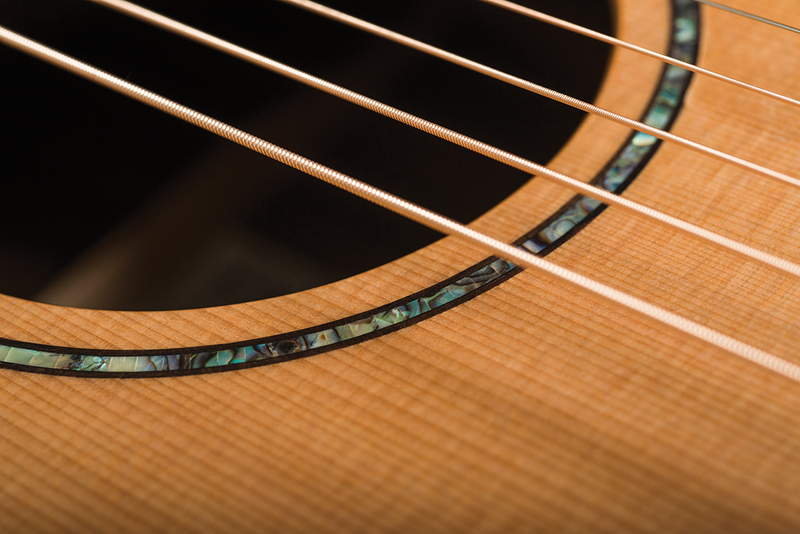 Maple/rosewood/mahogany purflings, maple back strips and an abalone rosette with jade greens and kingfisher blues providing the decorative flourishes for both guitars. 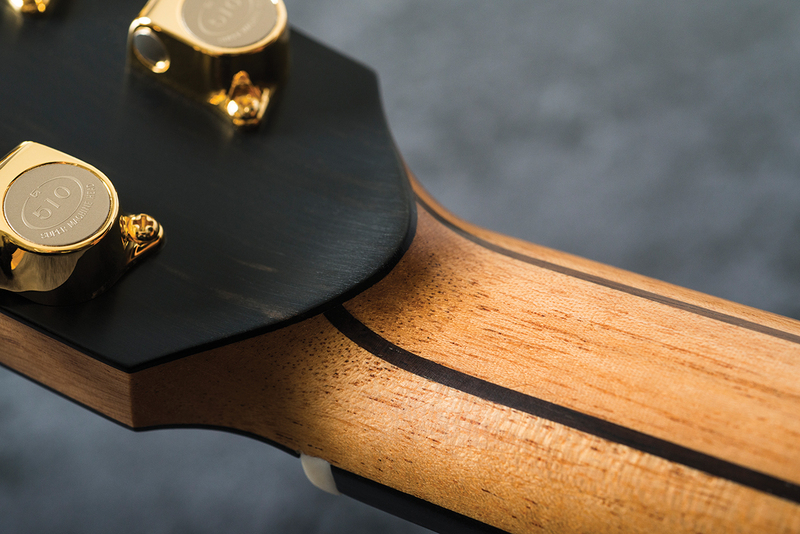 Other common features include the ebony fingerboard and peghead overlay, the top loading rosewood bridge with split bone saddle and gold plated Gotoh 510 tuners with ebony buttons. With their classic open C Lowden neck profiles, perfect setups and identical sets of 0.012 coated phosphor bronze string, both guitars feel identical to play. The body size is supremely comfortable, and with lowered string tension from the shortened scale length, electric players will feel just as comfortable as acoustic veterans. So, let’s get to grips with the non-cutaway cedar/walnut model. 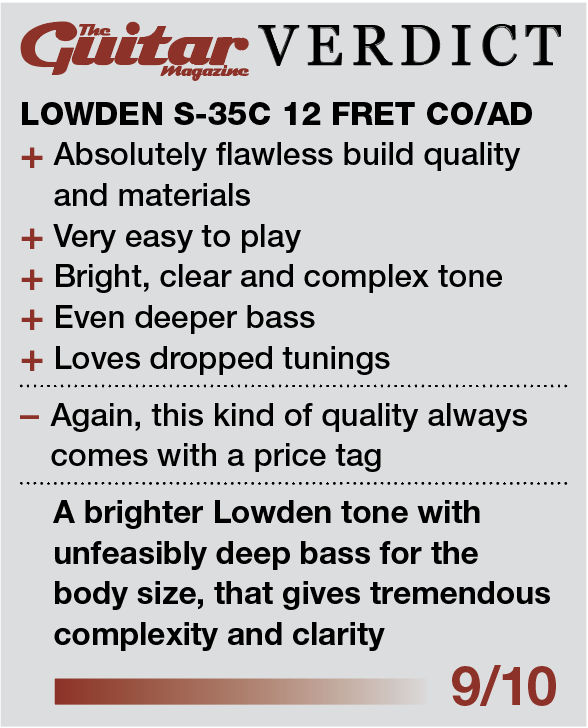 It might have been reasonable to anticipate a smaller sounding take on classic Lowden tone, but instead it doesn’t sound small at all. However, from the first strum, there can be no doubt about the origins of this guitar. We’re talking sweetness, depth, rounded trebles, impressive projection and a natural tonal balance that lends itself equally well to strumming and fingerpicking. Without sounding in any way lacking in vibrancy or dynamics, there’s an easygoing softness and warmth to this guitar that draws you right in. While recognising the practicality of cutaways, particularly with 12-fretters, it has rarely been our aesthetic preference. 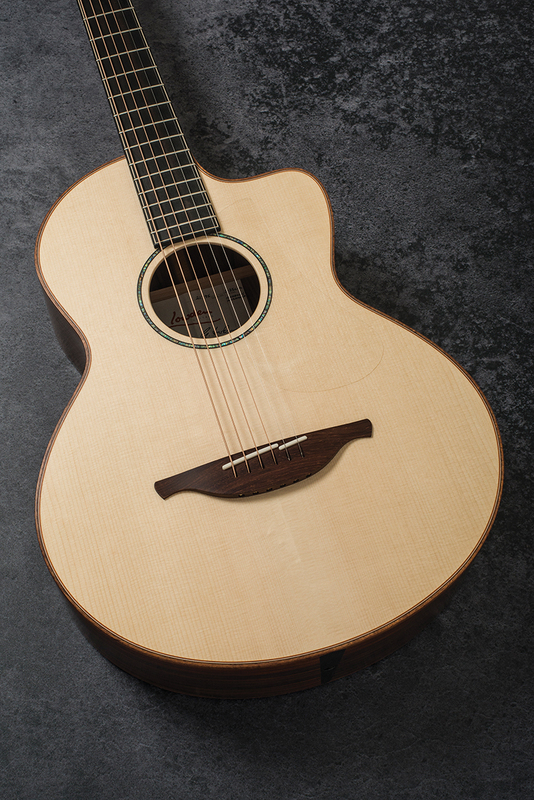 However, in this case we think the spruce/rosewood body shape looks just as good and maybe even a little better. Either way, when you’re playing, the cutaway is invisible and you only become aware of it when you look down and wonder how your left hand managed to get up so high. You can leave your thumb behind the heel and still reach the top fret. It probably comes as no surprise to learn that the spruce top sounds brighter than the cedar, but the bass is also a tad firmer and deeper. Naturally this de-emphasises the midrange and lends a shimmery harp-like sheen to the upper frequencies, along with a punchier and more percussive edge. This faster response and enhanced clarity helps strummed parts to cut through, but it does demand a greater degree of accuracy when you’re finger picking. 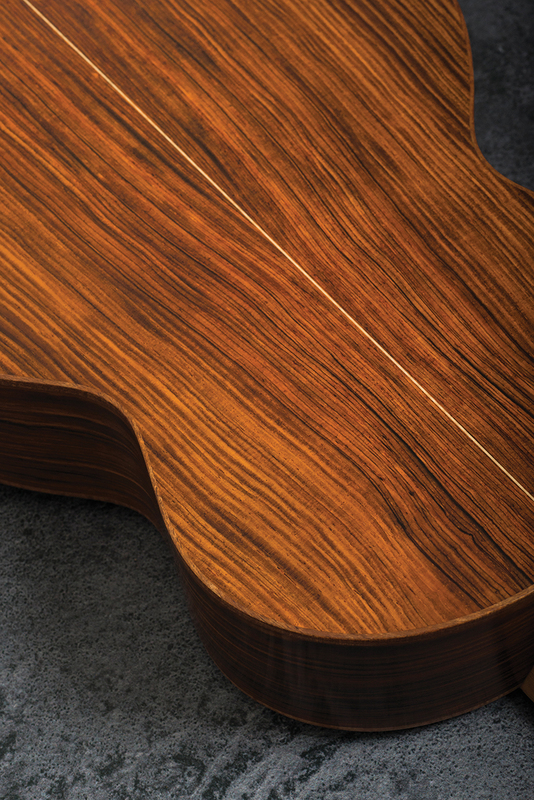 The tone is certainly more complex and harmonics linger inside the cocobolo body much like the finest rosewood guitars. In fact, both of these models also achieve extraordinary sustain that puts them right up there with the new V-Class Taylors. Despite the small bodies and the 12th fret neck joins, neither guitar has a ‘vintage’ tone and they owe little, if anything, to the American tradition. The cedar top model may be slightly more mid focused, there is no discernible boxiness and we have played dreadnoughts with less bass extension than these two. More impressive still, they don’t run out of puff when you de-tune. The cedar model is just fine down to D, but if you plan to go lower, the extra snap and tautness of the spruce/rosewood pairing helps to keep things punchier and more defined at low-C and beyond.